Shoes: Sperry Bahama’s – find HERE, but how about THESE for fall?? This week has been quite the experience. On Saturday, my hometown experienced a major lightening storm. By Sunday morning, because the area is so dry, dozens of fires had started. Monday morning, I awoke to the police pounding at my door telling us we were at a Level 1 evacuation and to be prepared. I have been on evacuation warning at least 5 times in my lifetime and was not worried, but as Monday night rolled around, the fire had crested a hill by my house and I could see flames from my bedroom window. Tuesday morning, we were put on Level 3 evacuation and the panic set in. Have you ever wondered what you would pack in the unfortunate event of a fire? Well, actually packing for such an event is the most STRESSFUL thing ever (to be expected). I spent most of the morning pacing wondering what to take and settled on my computer, pictures and a few cozy clothing items (plus a few new things I hadn’t got the chance to wear…). The rest of the day was a waiting game, as firetrucks and police officers roamed the street and helicopters flew right overhead with buckets of water. Typically an extremely windy area, we got lucky as the wind has hardly blown the past few days, making for more favorable conditions. As of this morning, I believe we are out of trouble, but a thick smoke has settled, creating a weird haze and hazardous air. NO FUN. I have seen this sweater EVERYWHERE. It’s no wonder why, as it’s cozy, cute and was quite the bargain. I’m really wishing I would have snatched up the brown version before it sold out. This will definitely be one of my favorites through fall and winter! Previous Post Transitions and a Giveaway Winner! Love this look! Cute sweater! Fires are so scary! Hope all is well! Love this polka dot look, those shoes are too cute! you look super pretty! Love the shoes and the whole outfit! LOVE those shorts too! GREAT color combo! Love this color combination :). Might need to go check out Old Navy! Sorry to hear about the fires-hope all clears up soon! I love that outifit! <3 so amazing! I love this mix of prints and colors you made.. so cute. This outfit is so cute!! I love your top – too bad it's sold out, and your Sperry's are adorable! You look great! I LOVE this outfit! It is awesome! Hi Ashley! Thank you so much, I follow you back with pleasure dear:) So cute style, I like the sweater and the bag, too nice! :) Kisses! That top is just perfect, so pretty! Beautiful outfit, beautiful girl ! ciaoo…volevo ringraziato per avermi aggiunta mi ha fatto davvero piacere …e volevo dirti che le tue scarpe mi piacciono molto e anche la borsa …..e ti stanno davvero bene..un bacio…ripassa se vuoi..
Love your polka dot sweater <3 and bag is perfect. Oh no darling! I'm thinking of you and please stay safe! On a style note–I wrote about polka dots today too LOL! You look absolutely adorable! I can't get over how fabulous your polka dots look with those leopard Sperry's! What a nightmare, I can't even imagine. And having to pack to evacuate must be awful! Thanks so much for your comment, I'm following you now. so cute. love the polka dots. That's a nightmare. Geezzee!! No bueno!! But… I LOVE this look!!! Totally up my style alley!!! <3<3 Hope everything turns out ok! Just purchased this ON sweater and I'm SO excited to wear it with navy cords! You look adorable! p.s. i love the color of your shorts! Oh my word, that really is so crazy! Hope you're in the safe-zone now…aha, man that's scary. Haha, that polka dot sweater goes perfectly with your blue shorts. Plus, the leopard loafers are so awesome! Oh, wow. I'm sorry you had to go through that and I've been in a similar situation myself. The first things I packed were my literature books and shoes. Would you believe. Glad it's all over now and you're safe. 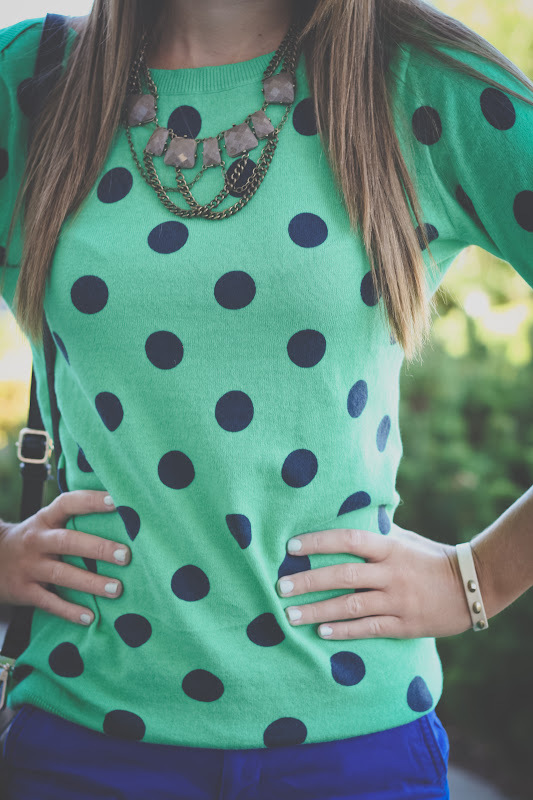 Love the polka dotted top. Love the polka dots and cheetah. Hi there! Thanks for visiting and following my blog! I follow you as well! Love love love your blog and outfits, keep in touch! Lovely outfit! I'm following you back now. Love everything about this outfit, fab pop of leopard creeping in as well as the dots! Great sweater ! You look lovely! i loveee your polkadots top. such lovely colours! That is the perfect size for a purse! LOVE this. Your blog is so impressive and very inspirational. Cute look! 🙂 Love your shoes btw. Hey, amazing post! I like the whole outfit but expecially the necklace 🙂 I k=just found your blog and I really like it! Love your top!!! And short! Such a perfect combination. I am bummed that the top is sold out. I followed you. I am wondering if you be kind enough to follow me back. I appreciate it. Thanks so much in advance!